Shaw’s Fish & Lobster Wharf makes it onto just about everyone’s list of best lobster rolls in Maine. We pulled into Shaw’s parking lot after a day of tastings, and at first glance didn’t know what to expect The building looked a bit rundown, a were welcomed a couple of dumpsters and a server smoking a cigarette and yapping on the phone outside the kitchen (see photo). Proceeding down the ramp, a gentleman working the fresh fish counter on the first floor pointed us upstairs to the restaurant. Like many lobster shacks on the Maine coast, this place is a step back in time. Rustic, but clean. A big open deck drew us outside as we waited for our rolls, which were, of course, made to order. 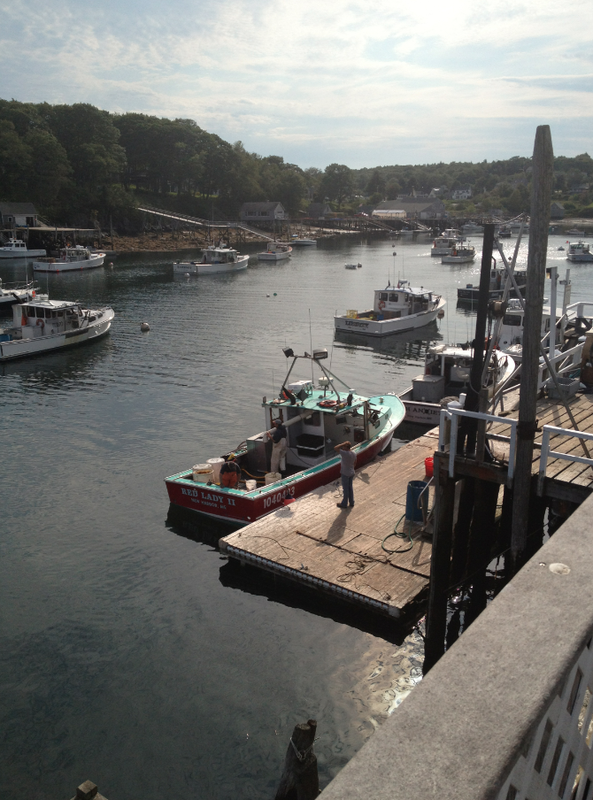 The deck overlooked a working dock, and we could see boats unloading lobsters right below us. If it looks familiar, it may be because Shaw’s doubled as Chet’s Grill in the movie, “Message In A Bottle,” featuring Kevin Costner, Robin Wright, and Paul Newman. Shaw’s runs right in the middle of the pack of great Maine lobster rolls joints. 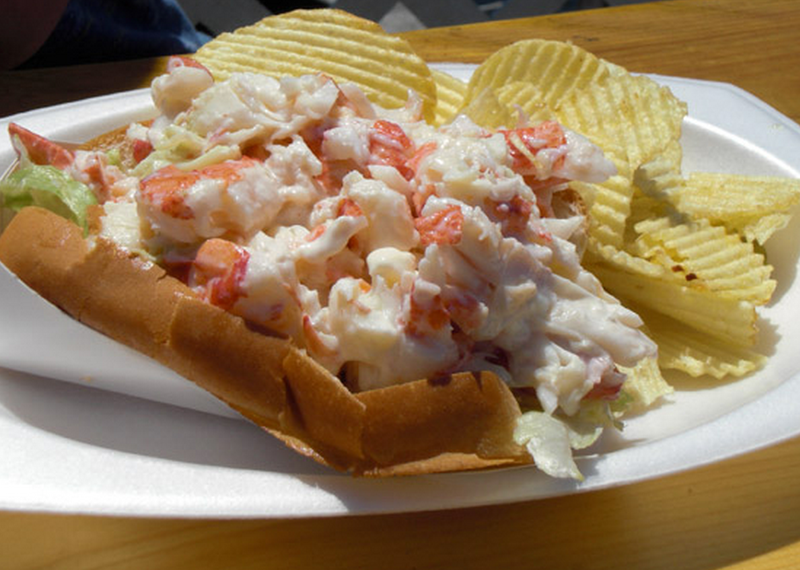 As good as these places are, they tend to be very similar to one another – a standard split-top hotdog roll buttered and grilled, and filled with very fresh, lightly dressed lobster meat over a bed of shredded lettuce. There’s nothing at all wrong about this, and Shaw’s makes a truly great roll. But it also means that these places do little to differentiate themselves from one another. The Clam Shack uses a round roll, as well as a combination of butter and mayo, which makes them stand out. Louie’s Alive & Kicking uses scali bread, which gives them a flavor all their own (while remaining faithful to tradition). Shaw’s is a fastball down the middle – a good, solid pitch that gets the job done, but with no “movement” on it. 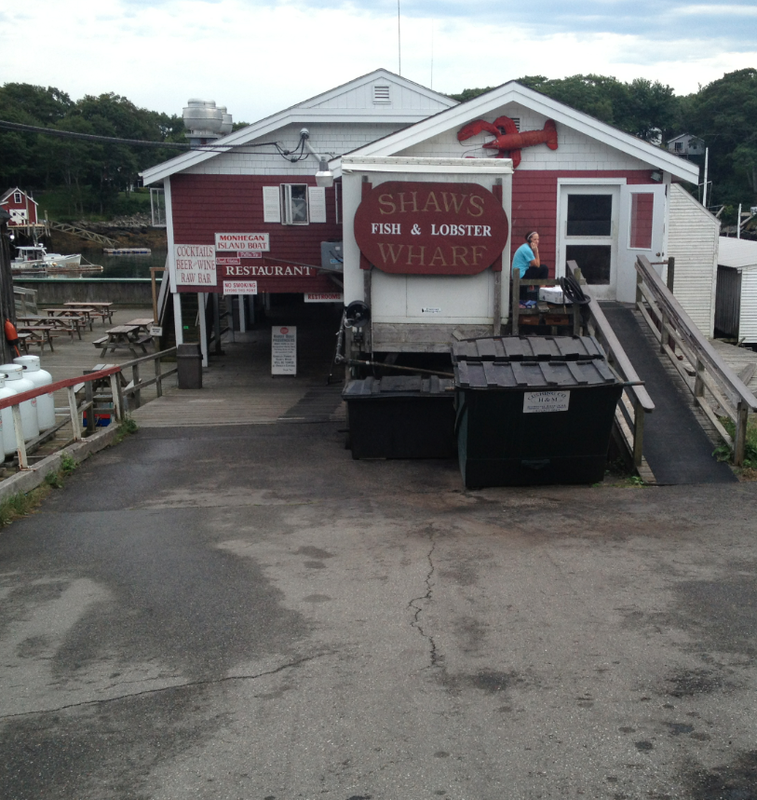 Shaw’s Fish & Lobster Wharf is located at 129 State Route 32 in New Harbor, ME. Their website appears to be down, but you can find them on FACEBOOK: http://www.facebook.com/pages/Shaws-Wharf/122322646713. PHONE: 207.677.2200. We forgot to take a photo of Shaw’s lobster rolls before devouring them, so we borrowed this snap from Yankee Magazine. We’ll be happy to remove the image upon request.